DC Password And Encrypted Data Manager Doc - Douglas Computing, Inc. 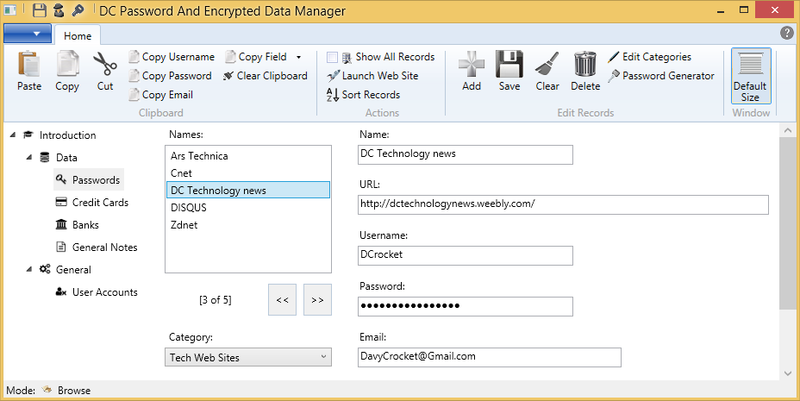 The DC Password And Encrypted Data Manager, is a Windows application that allows you to store and quickly retrieve login information for web sites, software applications, and all other situations where you need to access systems via passwords. The DC Password And Encrypted Data Manager also allows you to store credit card and bank account information, along with general notes. The data that is stored in the application is protected via 256 bit AES encryption. The application's other features include: a configurable random password generator; multi-user support; the ability to assign different roles to users; automatic data synchronization among copies of the application; and the ability to create and assign categories to password and general notes records, to better organize them. The DC Password And Encrypted Data Manager is a slick, intuitive, easy-to-use app, that gets the job done.